The Lower Bear Creek is an 8.2 mile stretch of creek that flows through the City of Lakewood in Jefferson County, the City and County of Denver, and the City of Sheridan in Arapahoe County. Land uses around the Creek include low and high-density residential areas, open spaces, and business developments. Lower Bear Creek is a place where residents can recreate, host family gatherings, and enjoy the outdoors. The Creek begins as a trickle on top of Mount Evans which is Denver’s nearest 14,000ft peak. The creek travels through forests, unaffected by urban pollution until it reaches the suburbs west of Denver. Here the water quality of Bear Creek changes dramatically.In 2010 the Lower Bear Creek, between Kipling Parkway and the confluence with the South Platte River, was listed as impaired by the Colorado Department of Public Health and Environment (CDPHE) because of elevated levels of the bacterium Escherichia coli (E. coli). Groundwork Denver’s Green Team had been working, since 2010, on invasive species removal and habitat restoration along the Bear Creek. As a result of the Green Team’s work on the Lower Bear Creek Groundwork Denver became interested in doing more to improve the creek. They met with CDPHE who encouraged them to apply for a non-point source pollution grant for watershed planning.Developing a non-point source watershed plan was a necessary next step in the process of addressing the elevated levels of E. coli in Lower Bear Creek. In 2012 Groundwork Denver received funding from the Colorado Department of Public Health and Environment through the Environmental Protection Agency’s (EPA) 319 Nonpoint Source funds. With EPA’s funding Groundwork Denver has successfully created a non-point source watershed plan for the Lower Bear Creek. To make this project possible, a strategic effort was made to form the right partnerships. Because non-point source contamination is not the issue of one entity per-se, it made sense to bring many partners to the table. Denver Parks and Recreation; Denver Environmental Health; the City of Sheridan; Lakewood Parks and Open Space; the National Parks Service Rivers, Trails, and Conservation Assistance program; the Cutthroat Chapter of Trout Unlimited; and residents of Lakewood, Denver, and Sheridan, were all convened by Groundwork Denver. Each partner participated in the Lower Bear Creek project either as part of the steering committee or members of sub-committees. Using EPA’s 9 Elements for a Watershed Plan as their guide, these groups helped determine what a watershed plan for Lower Bear Creek should look like. Tasks associated with completing the watershed plan included identification of causes of impairment and pollutants, community engagement, and water quality sampling. In addition to E. coli sampling, a River Watch team was instituted during the planning process. River Watch is a state-wide organization that supports groups in analysis of metals, nutrients and macroinvertebrates for water bodies. River Watch sampling of Lower Bear Creek began in winter 2013. Community members were engaged through various methods over a two year period. Door-to-door canvassing and volunteer events along the Lower Bear Creek ensured area residents were informed about the watershed planning process, and ensured participation, by over 100 area residents, in clean up and habitat restoration activities along the creek. Events offered residents and volunteers the opportunity to learn about urban water quality, wildlife habitat preservation, and actions individuals can take to protect urban waters. The watershed plan was completed in October 2014. It was a major success for Groundwork Denver and their partners. Achieving success meant bringing the right combination of experts to the table. Natural areas, environmental health, and public health experts share the Groundwork passion for clean air and water. The next step for the Bear Creek project is to accumulate several years of data based on the water quality monitoring plan described in the watershed plan. This data will be used to implement structural best management practices (BMPs) along the creek. Groundwork Denver was created in response to a feasibility study that found while much of the City of Denver is known for its parks and well-maintained streetscapes, there are neighborhoods without the resources to develop this level of infrastructure. 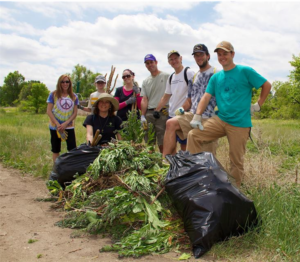 The mission of Groundwork Denver is to bring about the sustained improvement of the physical environment and promote health and well-being through community-based. River Watch is a state-wide organization that supports groups in analysis of metals, nutrients and macroinvertebrates for water bodies. A River Watch team was instituted as part of Groundwork Denver’s work on the Lower Bear Creek. The data gathered will be used by the State, in addition to the data collected by Groundwork Denver, to help build a more comprehensive prolife of contaminants in the creek.